The current Chevrolet Corvette Z06 is a supercharged monster, a 650 horsepower nightmare aimed at dominating the track in a way that shames Hellcats and Porsches alike. But it has a well-documented problem with overheating. Now Z06 owners have filed a class-action lawsuit against General Motors today, alleging that GM’s top-tier trackrat doesn’t deliver the performance they were promised. 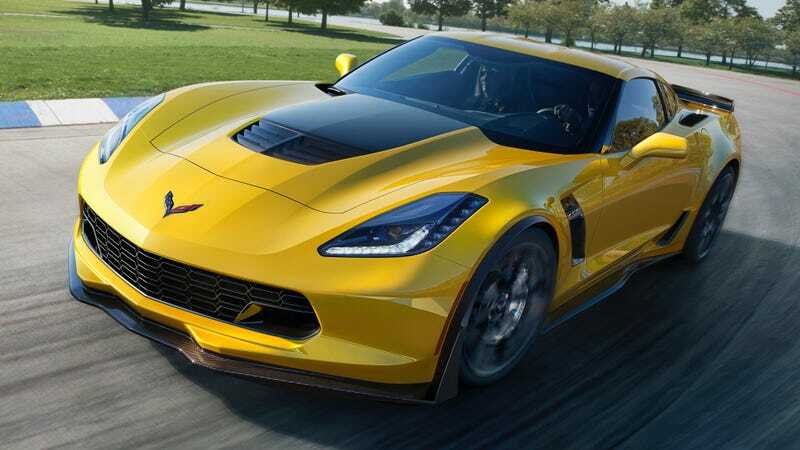 The lawsuit claims that a cooling system defect can put the 2015-2017 Z06 into “limp mode” after only 15 minutes of track use. Fifteen minutes! Not much of a track day. “Limp mode” drastically reduces the car’s power and speed. A sudden loss of power can create a dangerous situation on track, as speeding traffic around a limping car may not expect that car to slow down, the lawsuit said. Given that most track day sessions last longer than 15 minutes, this can be a major problem when you can’t get all of the track time you paid for as well. The suit, filed today by perpetually automaker-suing firm Hagens Berman, claims the Z06 can go into limp mode on public roads, so it’s not a problem limited to owners who use their Z06 on track. The cooling system defect allegedly warps vital engine components due to the high temperatures, causing further headaches over costly repairs. We reached out to GM for comment but have not heard back yet; this post will be updated if that happens. The suit has been filed in the U.S. District Court for the Southern District of Florida, and it alleges that GM knew of the issue yet failed to disclose it and ensure that owners could operate their cars safely. We believe we’ve found GM to be guilty of a classic bait and switch – one that cost thousands of consumers dearly, up to $120,000, and broke state consumer protection laws. GM enticed race enthusiasts with bells and whistles, promising a car that could maintain safe speeds and power when tracked, but we believe what it sold them was far from what it promised. This defect not only damages the Z06 engine, but endangers drivers. The defect in question markedly limits the car’s performance – the sole reason these hotrod enthusiasts bought the Corvette Z06 in the first place. If they’d known of this defect at the time of purchase, they likely wouldn’t have spent six figures on the Z06. The lawsuit claims that GM violated state and federal laws, and has brought counts of breach of warranty, fradulent concealment, unjust enrichment and other claims against the company. It seeks monetary damages for affected owners, included for the diminished value of the car now that many people associate the Z06 with overheating problems on track. Attorneys estimate that over 30,000 2015-2017 model year Corvette Z06s are affected by this defect, and have asked owners of cars that may be affected to contact the firm with any questions related to the alleged defect or the class-action lawsuit itself. The Z06s’s engine cooling issues are well-known at this point. A heat-soaked Z06 was quickly eliminated from contention in Motor Trend’s Best Driver’s Car test in 2015 after going into a similar limp mode on track with test driver Randy Pobst behind the wheel. GM, however, maintained that the car Motor Trend got for their test went into limp mode due to a servicing oversight; yet it was far from the only mechanical issue we’ve heard from journalists or owners about the current-generation Z06. The 2017 Z06 received several upgrades to its cooling system as a result of problems reported with the car, however, this year’s model is also listed in the list of affected cars in the class-action lawsuit. You can view the full text of the class-action lawsuit below.